Supplement to last post. This is the unique set of OUTSIDE Stephenson link valve gear as fitted to ex-LMS Black Five no 44767. There is one set per cylinder. Note it is in neutral or mid gear in this photo as the loco was parked up not in steam. How point A is arranged on Pet is the one significant item I didn't get in the photos. It is the fixed point from where forwards the fore and aft motion of the valve rod spindle has to be on the centre line of the bore in the cylinder block and from there backwards the movement is in both the vertical and the fore and aft plane as the axle mounted eccentrics revolve. The steam moves the piston, the piston moves the axle, the eccentrics are revolved and they drive the valve gear, that closes and opens the in/out steam ports and the piston is powered the other way and the engine moves (Cycle repeats). The orange line shows how the power element of the system is off set from the centre line of the axle. The one on the other side of the engine has the corresonding orange crank line at 90 degrees. 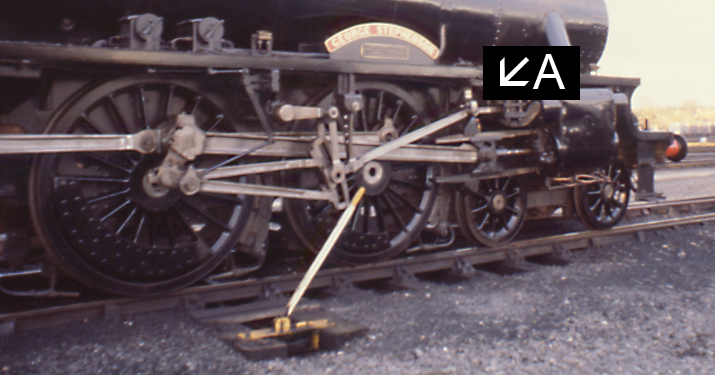 On 44767 the valve motion is worked by cranks but to simplify the idea I have added the red blob to show how on an inside set of this gear the eccentrics surround the actual axle and move far less. To make 44767 move forward the die block in the curved link is raised and the top rod becomes active. The turning of the eccentric is transmitted to a fore and aft motion in the valve rodding and the valve in the cylinder moves fore and aft opening and closing the relevant ports. If the block is dropped the converse action occurs, the lower rod is the active one and the ports open and close in the opposing sequence and it goes backwards. You may have heard of cut off in relation to driving a steam engine. In the above example the die block fully dropped or fully raised gives a full movement of the valve rod in the cylinder and a full port opening per stroke - maximum input of steam and maximum power. Anything between all the way and the centre in the expansion link reduces movement in the valve rod thus reducing the port opening size/time and cuts off the steam flow early increasing efficiency of the engine. Note - photo taken whilst working with the engine preparation team and therefore with full permissions to be wrong side of the fence! Last edited by John New on Thu Jun 20, 2013 10:11 am, edited 3 times in total. I have sent you a sketch of how I understand the expansion link to work, James Waterfield had indicated to me that it functions the same way as on the hunslet locos there is no knuckle joint like the one on the loco in the last post the valve rod only moves in a for and aft motion. The note re the lack of a mounting bracket would make sense but I couldn't work out how the lifting link would work without bending the valve rod if the extra joint a la 44767 wasn't present. Probably all in the alignment geometry so definitely something to look at again next time I am in the NRM. HOWEVER there has to be some form of transition from the round bar stock of the valve rod to the casting forming the die block even if that is simply a rigid screw thread and socket arrangement. The valve rods are round the eccentric rods are rectangular/flat section. I suspect the valve rod ends are carried in the plate/stretcher bearing just in front of the expansion links so that keeps the ends in the right place. The knuckle joints are actually round the die blocks aren't they? That being so, that gives all the articulation you need to make it work. 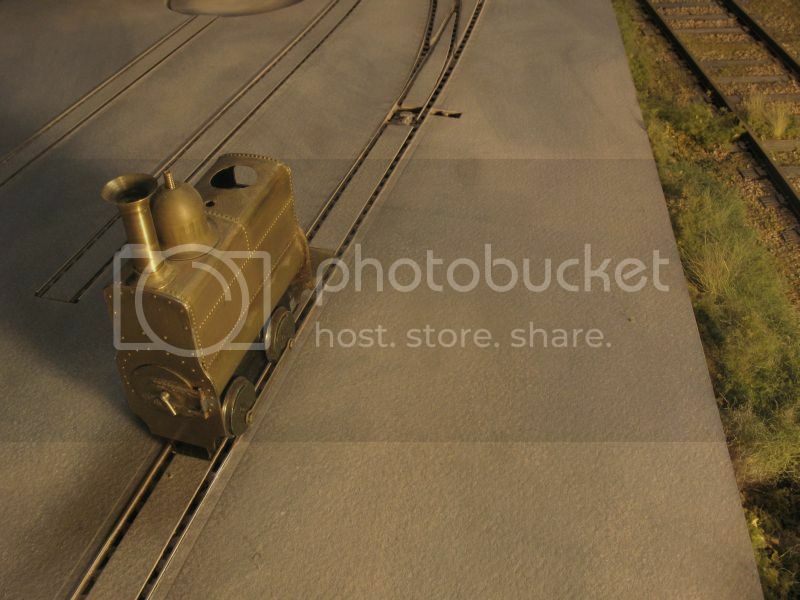 I am very interested in this because I am at that stage on my full size Effie which was inspired by the Crewe engines. I suspect the valve rod ends are carried in the plate/stretcher bearing just in front of the expansion links so that keeps the ends in the right place. Firstly glad you found them useful James. I was up in York again for Christmas/New Year and awaiting arrival of a new grand daughter. Consequently I did manage to get into the museum again and now I'm home also able to use Photoshop and upload 18 extra photo's taken to fill gaps. I think these extras now posted onto Fotopic will answer almost all the outstanding queries. The valve rods look to be a machined casting or length of turned down rectangular bar. They leave the cylinder end in circular section and just before they enter the support block which is mounted on the frame stretcher they convert to rectangular section. The joint is flared from the round to the rectangular section therefore I doubt that joint is a threaded one hence the comment about a machined casting. I wasn't able to get a ruler onto the parts but they appear visually to be rectangular, almost a square section but slightly wider in the width than in the height. As you can see from the second image below they don't appear to be identical! The pair seem to be a machined fit into the rectangular aperture in the casting bolted to the spectacle plate so that acts as the supporting guide replacing the extra joint/support as per 44767 and as James suggested. The knuckle end fits around the lifting link with a pin through the slot in that link therefore, as James pointed out, the pivot A as shown on the 44767 image isn't needed. The light bulb moment (Duhh!) was realizing that the curve in the slot in the lifting link must match the arc produced when the bell crank system supporting that link gets moved by the driver. I also missed in the earlier photo's but seen now is that on the RHS of the engine there is a balance weight on an arm counter balancing the dead weight of the valve motion rods. Hope this also helps some one! Note the non-rusty bar (the LHS as we are looking upwards) seems to be slightly wider than the rustier one (RHS). Is this actually true, in that the machining of both is slightly off-centre and the LHS also marginally wider or just an optical illusion? John I am going to guess that this is an optical illusion stemming from the fact that one is covered in grease and grime and the other isn't, I think that you are might be correct in thinking that rod is cast rather than machined from a bar. A casting would be pretty simple for the loco works with a bit of clean up at each end. Any news about this project, or have it stalled ? Hello Henrik, no it is not stalled, I just have to finish up a small contract that has been a bit of an Albatros. The model is sitting right in front of me and I look at it every day wanting to get back at it. I hope to be back at it before the end of the month. No hurry, I was just curious .. The prototype is one of my favorites to. Your version in brass looks great. Spent a fair bit of time looking for the rear railing that I had made but to no avail. So I will have to make a new set of posts and the rail. Now that Macton is on the mend, I am sure that Bertrand will want to get back to the work at hand. Gnice to see Pet once more Michael. John New wrote: To assist Michael with the accuracy of this build I volunteered to take some detail photos of the valve gear bits of Pet that other people don't normally photograph whilst I was in the NRM for our SLS Centenary celebrations last weekend. Plus a taster from the detail set. Fotopic failed - images now reloaded here http://www.island-publishing.co.uk/jalb ... index.html with apologies for the delay in getting the replacements loaded. John New wrote: Supplement to last post. This is the unique set of OUTSIDE Stephenson link valve gear as fitted to ex-LMS Black Five no 44767. There is one set per cylinder. 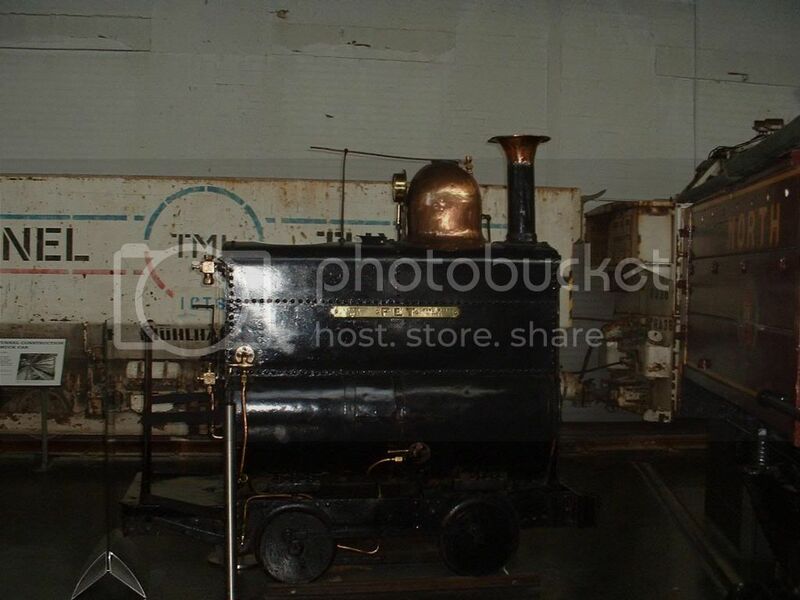 Note it is in neutral or mid gear in this photo as the loco was parked up not in steam. Good to see Pet progressing again, Michael. I forgot a tape measure but have included a camera case for scale in a couple of them. I have been in touch with the national railway museum and have ordered a crew drawing of pet I understand that it is more detailed than the drawing in the crew narrow gauge system book. I will be continuing my set of cad drawings.